With the state of Illinois experiencing a budget shortfall, Republican gubernatorial candidate Jim Ryan unveiled a proposed amendment to the state constitution Wednesday that, he believes, will prevent similar deficits in the future by capping state spending growth. Ryan said this amendment would limit spending increases to the rate of inflation plus the state’s population growth. Adding those two percentage figures would determine the spending cap. Gov. George Ryan, whose spot Jim Ryan is running for, announced last week that Illinois is $80 million behind budget estimates for the first fiscal quarter of 2003, which ended Sep. 30. He also said the state has a projected $2 billion shortfall for the 2004 fiscal year. Because the state constitution requires a balanced budget, either tax hikes or spending cuts would be needed to make up for that shortfall. Pat Quinn, running mate to Rod Blagojevich on the Democratic gubernatorial ticket, agreed that spending needs to be cut, but criticized the amendment proposal. 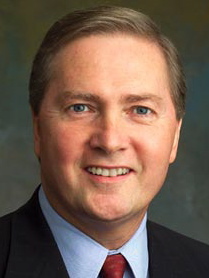 Jim Ryan conceded that his proposal would not provide a short-term elixir to the 2004 estimates. Ryan said he based his plan on an amendment to Colorado’s constitution, which passed in 1993. Ryan estimated that the state would have accumulated a savings of $3 billion over the past four years had this amendment been in place. He said the budget state budget surplus three years ago stood at $1.5 billion, while no surplus existed last year. “We can’t continue to spend every cent in the good times, because then there is no money to fall back on in the bad times,” Ryan said. The attorney general said he hopes to hit a point where the state builds its end-of-year balance and rainy-day fund to “where we need to be.” He said he would consider a tax rebate or cut if state finances allow one if the future. Quinn blamed the lack of fiscal discipline on the current administration, and said Blagojevich would not follow its pattern.